Ailsa Bristow watches Canadian sci-fi cloning drama, Orphan Black and finds a striking affirmation of the feminist adage “biology isn’t destiny”. NB: This review contains spoilers for the first three episodes of Season one (no longer available on iPlayer). The stereotype that women don’t watch sci-fi bores me as much as the next geek-girl feminist. But sci-fi as a genre undeniably has something of a shaky history when it comes to feminism. It’s not that strong and complex female characters don’t exist in science fiction (the excellent Battlestar Galactica springs to mind as being chock full of them), it’s just that all too often women characters seem to fall somewhere on the “slutty nemesis” to “damsel in distress” spectrum. This makes Orphan Black, currently airing on BBC 3, a welcome addition to our screens. Orphan Black introduces us to Sarah (Tatiana Maslany), a street-smart young woman with more than a few skeletons in her closet. She is immediately identifiable as a troubled youth: headphones in, punk clothes, casual swearing. The viewer is primed for a gritty issue led drama. But the show rapidly flips our expectations, as Sarah encounters her mirror image – a high-heeled sleeker version of herself – who takes off her shoes, folds her suit jacket and jumps in front of a train. As Sarah makes the fateful decision to take her doppelganger’s bag from the scene of the suicide, she dives into a world of identity crises. A synopsis of episode four of Orphan Black (containing spoilers) can be found here. You can catch episode five of Orphan Black on BBC iPlayer until 9.44pm tonight (Friday 18 October), with episode six soon to follow after it has been screened on BBC 3. Provisional cover for forthcoming European DVD release of the first season of Orphan Black (released 14 August 2014). 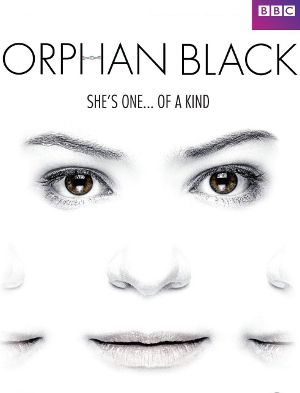 This shows the outline of eyes, a nose and a mouth (possibly Tatiana Maslany’s) against a white background, with the beginnings of a repeat (one eye, half a nose and half a mouth) on either side. The white BBC logo in a purple rectangle is in the top right hand corner, with ‘ORPHAN BLACK’ in the centre below (with the bar in the H possibly evoking a DNA strand) and ‘SHES ONE… OF A KIND’ in the centre just below that (all in black capital letters).